I have released two new digital stamps, "Give Thanks" and "Happy Sunflower"! These are fun and simple designs that just make you smile! I love being able to draw in different styles and making things simple to more detailed. I also have discovered I really like creating word art! 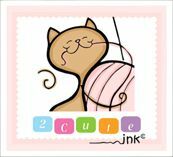 Both digital stamps are now in my 2Cuteink Etsy Shop! Estan muy belllos gracias por compartir tu trabajo tus diseños son inspiradores, todos los meses hago mi compra en etsy.